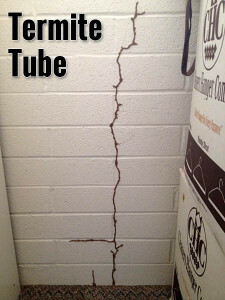 Termites anywhere in Arizona, from Gilbert, Chandler or Mesa to Carefree, are no joke. They will start small, working their way through your home, until you realize they’ve infested your property wreaking havoc on your exterior, interior, and wallet. Magic Pest Control uses Arizona’s best termiticide and exterminating solution. Termites rank high on the list of the most destructive pests because they often hide in silence until they’ve caused significant structural damage to your home, commercial, or industrial building. Termites are extremely hardy insects that require three basic things to survive and thrive: food, moisture, and shelter. Unfortunately, homes and commercial buildings provide all of these things in ready supply. Drywood termites literally eat themselves out of house and home. They live and thrive in the wood they consume. 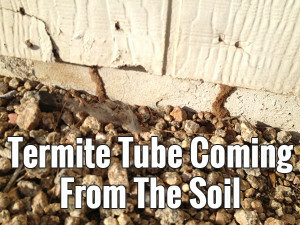 How can you have termite control in your home or building? Step 1: Consult a Professional — since termites represent a silent and significant threat to your home or commercial building, we recommend first getting your home evaluated by a professional who can expertly identify the extent of your problem and recommend a course of action. 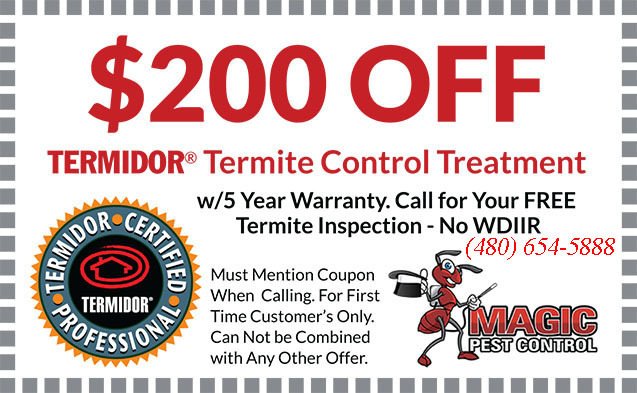 Magic Pest Control has over 31 years of experience treating termite infestations, and we offer the best price and service in the Valley! Contact us for a free estimate! Step 2: Take Care of Moisture Issues — Termites need moisture in order to survive and unfortunately, many residential and commercial buildings provide a number of ideally damp places for termites to set up shop, such as leaky faucets, pipes, and air-conditioning units. Do your best to ensure that your building is as moisture-free as possible. Step 3: Take Away Their Food — Firewood, lumber, paper, tree stumps, and wooden decks may look harmless enough to you, but it’s basically an all-you-can-eat buffet for termites. Do your best to keep these items as far from the foundation of your home as possible. For immovable wooden pieces like fences or decks, make sure that you’re actively checking for signs of damage. If you see any of these signs and are worried that you might have termites, contact us for a free estimate!